There were moments in this movie when I felt like cheering out loud. Not necessarily political moments but there is one scene, for instance, when Thatcher is being gently grilled by her doctor. "How are you feeling Margaret?". "Feeling?" she replies. "Feeling? That's the trouble these days. Everybody talks about feelings. Nobody talks about thinking. Never thoughts. Or ideas. That's what I'm interested in. What people are thinking." Or to that effect. There is a moment where the ageing Thatcher is bailed up by a young woman who heard her speak at a conference. She thanks Thatcher for paving the way for other women "to be something." Thatcher ponders, "In my day it was about doing something. Today it's all about being something." It's a very intense picture necessarily so through the depiction of Thatcher's intensity. By the time it ended I was ready to get out of there. I had been led to believe it showed a lighter side of Thatcher. I couldn't find it. You saw a woman who appeared to establish her principles very young and never waver. No compromise, no conciliation. Her husband is painted in a kind light. If there was any confusion about Thatcher at all it is whether she depended on him heavily, or drew all her strength inwardly. The ending doesn't resolve that. The earlier times when a sharper division was drawn between socialism and conservatism described Thatcher's values simply. Heavily influenced by her father who claims in a speech, "Everybody isn't equal. That's a nonsense. Never have been and never will be. But they all need to chance to achieve..." (Again to that effect). His ideas are echoed in Margaret later fiercely arguing for the poll tax with her cabinet. "Everybody must pay some tax. Everybody must have some stake in their community. Even the poorest must have some ownership or do they live in graffiti covered, litter strewn landscapes?" It is a movie I highly recommend (especially to John Key). Will you enjoy it? That is the wrong adjective to describe the experience. I didn't shed a tear. Strangely enough it will made me think rather than feel. The NZ Herald has a piece about this year's road toll being the lowest since 1951. The toll peaked at 843 deaths in 1973, leading to the first drink-drive blitzes followed by anti-speeding and pro-seatbelt campaigns. In 1973 the toll comprised 273 driver deaths, 250 passenger deaths, 130 motorcyclist and pillion passenger deaths, 30 pedal cyclist deaths and 157 pedestrian deaths (other = 3). The largest drop percentage-wise was among pedestrians. In 2010 40 percent of pedestrian deaths were amongst people aged 19 or younger. The share of the population that is young today is far lower than in 1973. So demographics are making a contribution to the lower number. But I wonder how much children not walking to school has helped lower the toll? Meanwhile, if you’re a worker, start tightening your belt: The Social Security taxes taken out of your paycheck could rise to $6,826.82 next year, from $4485.60 this year—a significant $2341.22 hike. The increase is due to two factors. First, as the SSA announced today, the maximum salary subject to Social Security tax is rising from $106,800 in 2011 to $110,100 in 2012 as part of the just announced inflation adjustments. That increase affects about 10 million wage earners. Second, a temporary 2011 rate cut in the employee’s part of the Social Security tax—from 6.2% to 4.2% of pay–is scheduled to expire. As part of his proposed jobs package, President Barack Obama wants to cut the employees’ Social Security tax to just 3.1% for 2012. But Republicans have so far shown no inclination to pass the provision, which would cost $175 billion and seem ready to let the 2011 rate cut lapse, leading to a tax hike on all workers. Large families no longer able to feed their children, dwindling welfare and unemployment. Actually I am talking about Greece. But it doesn't require a great stretch of the imagination to picture New Zealand in 5 or 10 years time if people continue to depend heavily on the state to support children they can't afford to raise and this country is forced into severe cutbacks. The mindset that welfare (including Working For Families) is a permanent and legitimate alternative to self-sufficiency must be changed. Dare I say it, for the sake of the children. Joris de Bres has entered the argument began by Paul Moon who objects to the term 'Maori child abuse' because it stigmatises all Maori parents. Professor Moon said the phrase was often used with good intentions, but he asked media and government agencies to stop employing it. I would be surprised if government agencies were employing it. I did a search of the Ministry of Social Development website and couldn't find one example. Then I tried CYF but turned up nothing. Police? No. I am assuming if the term was employed it would appear at the top of a search list of course. If I do a general search the initial results are dominated by Mr Moon's coverage. It's the classic case of bringing attention to something you are complaining too much attention is already brought to. And picking a low news time almost guarantees that attention. I have some sympathy for Paul Moon's point. A male Maori friend of mine once told me that when he had his nieces or nephews in his care people would look sideways at him if they played up. He felt very constrained in any action he could take because of what he felt about people's expectations. I suppose there is a legitimate case to use the descriptor if Maori child abuse was particularly different from other child abuse in nature. And it may be. In my limited experience I observe more 'neglect' by Maori parents but I refer to neglect as measured against over-protective middle-class standards. Maori child abuse may also have its aetiology in adolescent and teenage childbirth setting it apart from child abuse by other ethnicities. In the final analysis Maori children suffer disproportionately from abuse and neglect and if that stigmatises all Maori parents it is unfortunate. Only a dimwit would assume every Maori parent ill-treated their children when statistics show a very large majority do not. During the holidays I find time to review some of the best books I have read about welfare. An extra incentive came from an outfit in the US that wants a contribution from me for an upcoming anthology. After a year of mostly fulfilling painting commissions I am a bit rusty. 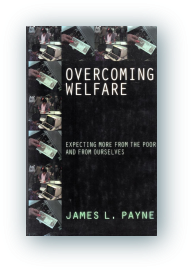 My favourite book is Overcoming Welfare by James L. Payne, an American. This post comprises some passages as I re-read the introduction. He is economical and highly effective in his writing. "As government established a massive presence in the welfare business, especially with the advent of the New Deal, it began to create constituencies and vested interests that reinforced the hand-out orientation. Making up one of these groups is social workers. As volunteers or employees of local, private charities, nineteenth century social workers had a position of independence from which they could observe, and comment on, the danger of handouts. The country thus gained a bastion of poverty experts who firmly and eloquently denounced sympathetic [something-for-nothing] giving. As government took over welfare activities, social workers became predominantly employees of government giveaway programs, and they had to align their thinking with these programs or leave the field." "In fighting this war we have created an industry that feeds on itself like a mad general who has lost thousands of soldiers but continues to say, ' I can still win if you send me more troops'. This is what our government's effort to fight poverty is like today. It is an endless cycle of programs, projects, and personnel, often supported by people with strong motives, but without a clear and sensible vision of what needs to be done. My community has not been untouched in this war. I live in central Milwaukee and my zip code has a large population of the shell-shocked. This is the result of being bombarded by programs that have reduced survival skills and the spirit of individual initiative." "Ideology also pushes welfare programs into the handout mode. For generations, many philosophers and reformers have embraced the doctrine of income redistribution, believing that government should take from the rich and give to the poor. A handout policy follows almost automatically from this approach. If the poor are mortally 'entitled' to government payments, it is wrong to demand that they do anything in return for them. Thus the policy of income redistribution has seriously harmed the cause of sound assistance policy." There are only so many blog Xmas Greetings you can take. Surely. So something to tuck away for post your eat/drink/be merry festival. In 1972 2.2 percent of government spending was on law and order; 16 percent on health and 23 percent on social welfare. 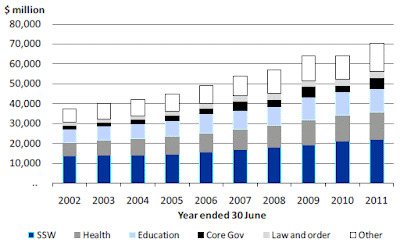 In 2011 4.8 percent went on law and order; 20 percent on health and 31 percent on social welfare. Education spending dropped slightly from 17.6 percent in 1972 to 16.5 in 2011. 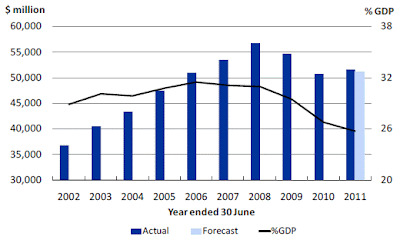 A crude interpretation might be that we have more crime, worse health and more 'need' to be met with welfare payments. I emphasise crude because there are of course many, many interpretations one could put on the figures. Now, first present to deliver - a walk for the dog.